Archibald Howie was born on 12 May 1879 in Glasgow, Scotland, son of mason Archibald Howie and his wife Janet, née Ferguson. At St Philip’s Anglican Church, Sydney, on 14 September 1912, he married Emily Clara (b.1883), daughter of Charles and Fanny Manuelle. He died on 26 October 1943 at his Hunters Hill home, survived by his wife, son and daughter. He was buried in the Presbyterian section of South Head Cemetery. Archibald Howie arrived in Sydney as an infant on the Clyde on 23 June 1881. He was educated at Fort Street Public School and Sydney Boys’ High School. He was an early resident of Balmain. He joined his father’s building business, becoming chairman of Howie, Moffat & Co Ltd, builders and contractors, after his father’s death in 1923. In 1927 he was elected president of the Master Builders’ Association of New South Wales. In the 1920s he was a Director, later chairman, of the Port Jackson & Manly Steam Ship Co, the Manly Gas Co Ltd and several other companies. From 1938 to 1940, Howie served two terms as President of the Sydney Chamber of Commerce. In 1939 he was appointed Chairman of the Advisory Panel for Defence Works. He was a noted stock breeder at his Navua stud near Richmond and was president of the federal council of the Australian Jersey Herd Society for five years. He was a member of the New South Wales Club and the Royal Sydney Yacht Squadron. 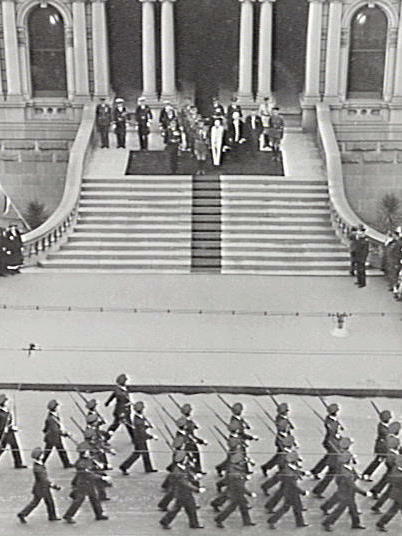 Between 1939 and 1942, Howie served on the Senate of the University of Sydney. He was also on the board of the Highland Society of New South Wales, a Trustee of the Sydney Cricket Ground; and President of the Royal Agricultural Society of New South Wales between 1941 and 1943. Howie was elected Member of the Legislative Council from 1934 to 1943. He was Chairman of the State Government’s Housing Improvements Board between 1936 and 1941. He was also an influential member of the United Australia Party. Sir Archibald Howie was knighted in 1938. Archibald Howie was Alderman for Macquarie Ward, 3 December 1934 to 5 December 1941. He was a member of the Finance Committee in 1935 and 1939, the Works Committee in 1935 and 1938-41, the Health and By-Laws Committee in 1938, the Health and Recreations Committee, 1939-41; and the Electricity Committee in 1940. 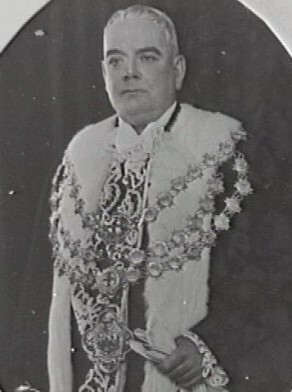 Howie was Lord Mayor in 1936-37. He represented the Citizens Reform Association. Peter Spearritt and Katherine Vasey, ‘Howie, Sir Archibald (1879–1943)’, Australian Dictionary of Biography, National Centre of Biography, Australian National University, http://adb.anu.edu.au/biography/howie-sir-archibald-6750/text11665, accessed 1 February 2013.